Concert and theatre hall of the Haagse Dierentuin (Den Haag Zoo), built 1893 by H. Wesstra jr. for the city of Den Haag. Opened 14 Nov 1893 with a concert of the Koninklijke Militaire Kapel (Royal Military Band). 1400 seats. IN World War II, used as baracks and military hospital by the German military. Later again used as concert and theatre hall. Closed 30 June 1968. 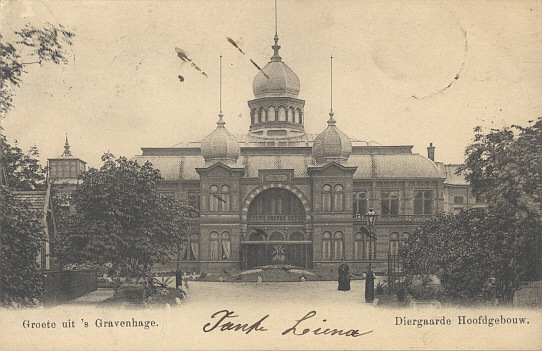 Demolished in 1968 in favour of government buildings, despite efforts of a citizen's group to save the concert hall and the zoo. Front Text: "Groete uit 's Gravenhage. Diergaarde Hoofdgebouw"